The CircularGauge is similar to traditional mechanical gauges that use a needle to display a value from some input, such as the speed of a vehicle or air pressure, for example. The minimum and maximum values displayable by the gauge can be set with the minimumValue and maximumValue properties. The angle at which these values are displayed can be set with the minimumValueAngle and maximumValueAngle properties of CircularGaugeStyle. 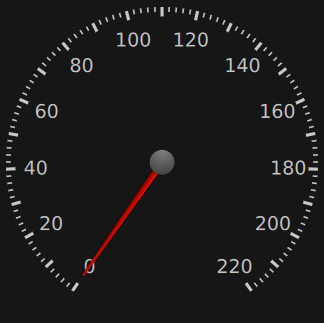 You can create a custom appearance for a CircularGauge by assigning a CircularGaugeStyle. This property holds the largest value displayed by the gauge. This property holds the smallest value displayed by the gauge. This property holds the size of the value increments that the needle displays. For example, when stepSize is 10 and value is 0, adding 5 to value will have no visible effect on the needle, although value will still be incremented. Adding an extra 5 to value will then cause the needle to point to 10. This property determines whether or not the gauge displays tickmarks, minor tickmarks, and labels. This property holds the current value displayed by the gauge, which will always be between minimumValue and maximumValue, inclusive.